If we’re paying attention to the small milestones (and good grief- WE ARE), it’s been just over two years that I’ve had a backyard. It’s an anniversary of sorts (but really not at all). The backyard is still partly graveled, with hopes of future raised beds. I still battle the weeds – but there are moments of such sweetness. Earlier this spring the gardenias made me think of my grandmother ever morning. Earlier this spring the orange blossoms had me and the bees drunk in love. My magnolia tree offered four glorious blooms. These days my fig tree is truly an unruly bush with little baby figs doing their best. The figs are neither big enough nor ripe enough to take off their bush and into the kitchen but they’re present enough to inspire some deep affection for the figs I’ve found at the grocery. The sweetest thing about my backyard as of late is the big brown dog named Maggie that I get to play with in that space. Gosh, leave it to a dog to make a backyard really feel like a backyard. And, in what is no surprise to me, her favorite place to rest, and chill, and hide her ball from me is under the fig bush. Well done sweet girl, Imma go make a cake. This cake is in a class of what I like to call Everyday Cakes. They’re simple buttermilk cakes, single layer, baked thick and golden. They can be dolled up and stripped bare. Let it be about what you have in the pantry and in the fruit bowl. In particular this cake shines with buttermilk, fig jam, mascarpone (totally optional but a sweet addition), and fresh figs. We’ll start by whisking together the wet ingredients + granulated sugar. Eggs and sugar whipped to glossy. We’ll add melted butter and vanilla extract and whisk to smooth. All of the liquids will help the sugars dissolve and disperse through the cake so it’s best to add the sugar here instead of with the dry ingredients. It’s very loose cake science. Buttermilk is my preferred dairy for this cake. I love the tartness. I love that the slight bit of acid helps boost the baking soda’s good work. We’ll add the flour, baking powder, baking soda, and salt directly to the top of the wet ingredients. And let the whisk do the good working of bringing the batter together. 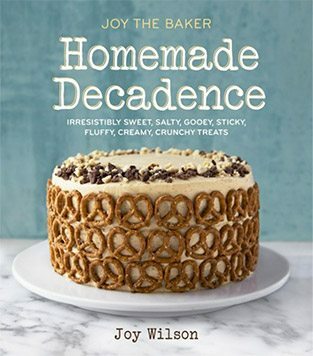 Whisk until smooth – get your elbow into it! The batter will be thick and smooth. Almost pourable. Mostly spoonable. The key to an Everyday Cake is its thickness. I think an 8-inch round with 3-inch tall sides works really well for this endeavor. I suggest you take my advice but then again I’m totally biased. On top of the cake we’ll dollop fig jam, and honey-sweetened mascarpone. We fancy, but also… let it be as fancy as your pantry is at the moment. Let cake be cake. Use a knife to lightly swirl the jam and mascarpone topping into the cake batter, leaving lots of visible bits on top. And lightly press fresh figs into the top of the batter. 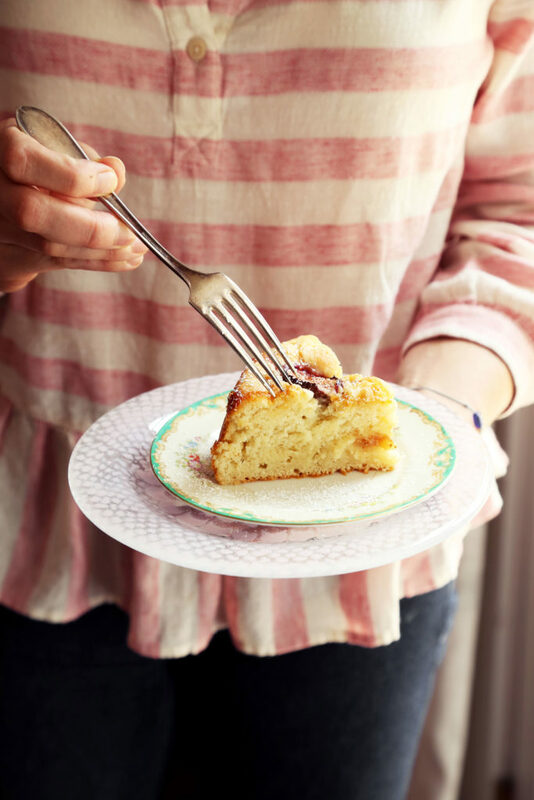 The buttermilk batter is sturdy enough to support most of the weight of the figs and jam, leaving them visible on top of the cake as it bakes to golden brown. Give it a long bake – at least 45 minutes in that 8-inch pan. Sit tight. Brew some coffee – a suggestion. This cake is sturdy. This cake happens to be exactly what you need it to be. Tender, lightly sweet, moist, thick, fruited, and jammed. It doesn’t need frosting, barely needs powdered sugar, always needs whipped cream and it’s just the kind of cake you want under a cake done every day of the week. I love you. More soon. In a small bowl stir together the honey and mascarpone. Dollop the mixture atop the cake batter. Dollop jam on top of the cake batter as well and use a butterknife to lightly swirl the two into the cake. 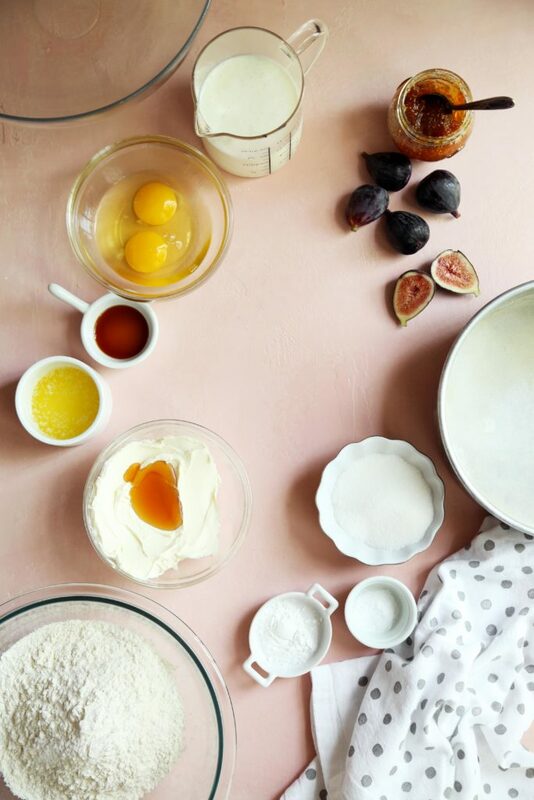 Dot with fresh figs, gently pressing not the cake batter. Previous Post: « Let It Be Monday, 186! 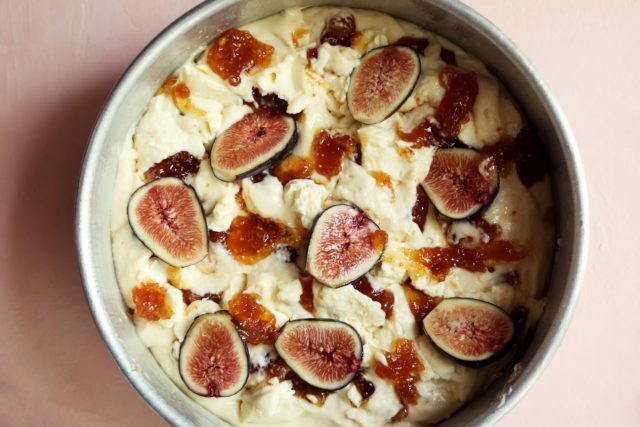 Wow – figs together with mascarpone! In a cake! And it’s easy! I even have everything for it in my kitchen right now, except for the fresh figs, which are gorgeous and plentiful at my corner store. I even have fig jam, bought just last week for a weekend wine and cheese I hosted (bought two jars because it’s so popular with cheese). I also have the eight inch round tall cake pan. What I don’t have however is a knack for removing cakes so nicely as the way you have, Joy, from that pan. Any tips/tricks for that besides the butter and dusting of flour that you could share? 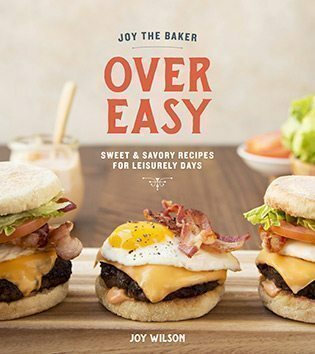 Thank you for this recipe, Joy! Would anyone else by any chance have any tips for removing a dense cake such as this from an 8-inch wide and 3-inch tall cake pan? Thank you :). Seconded! That sneak preview in your Insta stories was just a tease. Use a round of parchment at the bottom of the pan. Butter pan. Butter parchment. When cake is done cooking and you remove it from the oven, run a knife around the inside to prevent sticking to the sides during cooling. Should come out no problem. Did you get a dog?!?!?!?! This looks so good! I totally wish I was snacking on some right now! Dear Joy: I want you to know that I just love you. Your posts brighten many of my days (and I’m in general, a pretty chipper gal) and the Sundays give me intellectual and spiritual nourishment as well. At this point I’ve tired of reading the chitchat in most cooking blogs, but never yours. Don’t know how you get it all done. Thank you for providing a crucial public service! Love the new photo, btw . . . I have to be grain free, so I used my favorite grain free cake recipe. Everything else I left unchanged. Can you say birthday cake. Mine is in a month. This cake will look great with those ridiculous birthday candles from my kids. I can imagine this cake changing as different fruits come in season. Thanks so much for another wonderful recipe. My first dog used to love to dig herself a hole for chillin under the fig tree at our old house. Dogs always know the best resting places (or turn uncanny spots into the best resting places). It sounds like Maggie is settling in well! And this cake looks like a perfect summer-transitioning-to-fall treat — even if it will still feel like summer for a few more months. Just FYI your cake should be stripped bare not bear :) No need to publish this comment just wanted to let you know. Can berries be used rather than figs? When fresh figs and mascarpone are involved I’m for sure going to love it. And frosting on cakes is so overrated. Whipped cream instead please! Oh my goodness! You’re bringing back so many memories of South Texas, the figs, the gardenias, oh and the magnolia trees! Ok, I have to bake this cake for my grandsons! Thank you, Joy! This looks so good! Is there a way to make it with almond flour? I just made it with cup4cup gluten free flour and it is perfection — hope this helps! Oh, hot damn! This looks like a little bit of heaven at the end of summer!